Another beer from Jack’s Abby Brewing; Hoponius Union seems to be their most popular beer and is widely available on draft, in bottles and growlers at the brewery. I’ve tried the beer on draft multiple times so when I went to the brewery I opted for the 64 ounce growler. Hoponius pours a nice orange color with solid white head. Aroma has a nice sweet base like many other lagers but the hops also come through with some nice spicy, citrus and tropical notes. Taste follows with the same sweet malt base and crisp clean hops add plenty of grass, citrus and pine. Finish is super clean and only slightly bitter. This beer would satisfy most hoppy beer fans need for hops. 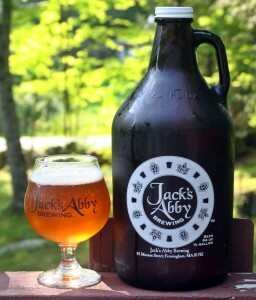 Hopefully Jack’s Abby will start distributing in Maine soon. Brewers Description: Hoponius Union harmoniously combines lager yeast fermentation and West Coast IPA hops. Our India style Pale Lager is like a traditional IPA but with a twist – it’s fermented cold and aged for extended periods. A blend of classic American hops creates a huge tropical fruit and citrusy hop aroma. A dry finish accentuates the pleasant bitterness and hop profile.